A Descent into the Maelstrom is a short story by Edgar Allan Poe about a very elderly looking man who relays a story regarding an enormous maelstrom that appears like clockwork off of the coast of Scandinavia. The story details the man and how he was one day horrifically sucked into the Maelstrom. While he managed to survive, he lost both of his brothers. This is one of a few of Poe's stories describing giant whirlpools. I did enjoy this one more than MS. Found in a Bottle due to, perhaps, better descriptions of the whirlpool itself. 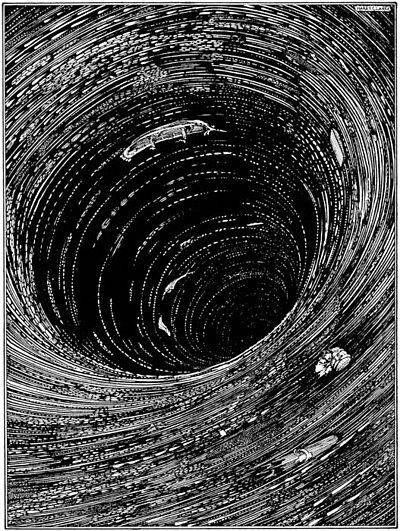 Poe keeps the reader in suspense by describing in detail the slow descent of the boat into the unknown abyss. I really enjoyed how the old man managed to use his wit to survive the wrath of the whirlpool by taking notice of how heavy objects descended faster than lighter objects. Like many of Poe's stories, wit saves the protagonist where otherwise they would meet their untimely demise. I would give the story a 3.8 out of 5. The descriptions of the maelstrom were very vivid. I felt like I was on the vessel circling the drain. I saw the walls of the whirlpool rising towards the dark sky, illuminated with flashes of lightning.